Hazel Nash awakens to discover her father dead and her brother injured in the car accident that put her in an eight-day coma. She remembers nothing of the crash or most of her former life. She even has to renew her acquaintance with her brother Skip. When she learns Jack Nash had enough poison in his system to be toxic, probably bringing on the fatal heart attack causing him to wreck the car, she sets out to discover who would wish to kill him and why. Jack Nash was a television personality. Like his radio-show father before him, he brought adventure to his viewers by trekking the globe in search of myths and mysteries to debunk and reveal. Along the line, also like his father, he was recruited to become a government agent, his TV program, House of Secrets, being a perfect cover for him and his camera crew to go into places most people couldn’t. He was supplied with a ready-made family and the excuse of patriotism, with his sense of adventure adding the final impetus. All this Hazel discovers as she sifts through her father’s past, as well as her own foggy memories. She remembers Jack had an obsession with Benedict Arnold, especially of the letter he wrote George Washington after narrowly escaping arrest, when he asks that he be sent his bibles. For years, Jack has been trying to find the pages of Arnold’s bible. Why is it so important? What exactly was that bible, anyway? As she learns about Jack’s covert activities, she uncovers something much more upsetting. Everywhere Jack went in his so-call TV filming, there was a child involved. One incident in particular is most disturbing. From the time he was seven, Jack always featured his son Skip in his show, but during a visit to Libya in 1983, something happened—and it changed not only Jack’s life but also Skip’s . . . forever. The death of a man in Spokane and the murder of a tourist in Dubai bring her to the answer, while a man known only as the Bear attempts to get rid of any evidence leading her to the truth, be it human or otherwise, as he also erases traces of where Hazel has been. With the hindrance and sometimes assistance of an FBI agent nicknamed Rabbit, Hazel arrives at the answer. She’s always been one who, once set on a path, won’t stop until she finds the answer she seeks. At the moment of truth, however, she’ll find she regrets that one fatal flaw. . . . 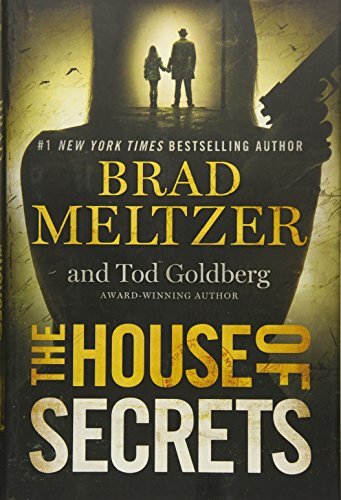 The House of Secrets contains an intriguing premise because it raises questions concerning the true reason for Benedict Arnold’s decampment to the British side. It’s disturbing because there may be a grain of truth lurking somewhere, but it’s perhaps a bit unbelievable, in that with today’s political scandals and public revelations, it’s highly doubtful the American public would bat an eye at the Nash family secret. Indeed, they’d probably applaud. Nevertheless, The House of Secrets is an entertaining and suspenseful story as Hazel Nash delves her lost past and unravels half-glimpsed memories to discover both she and her family are a fiction to each other as well as to the viewing public.